Writing Neoliberal Values examines human-interest stories that circulate narrative about how markets, in alliance with nation-states, promote freedom and claim to bring stability to marginalized peoples. The book unpacks bits and pieces of text that suggest radicalized and gendered distribution of abandonment, violence, and death that is inherent to neoliberalism. 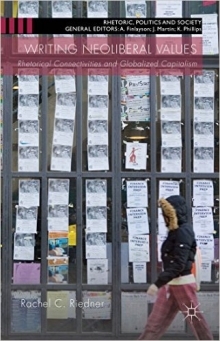 Building on these brief textual moments, the book asks: is it possible to track rhetorical violence within human-interest stories, linking it to wider political, economic, cultural, and discursive formations. At the same time, is it possible write hints of people, events, labor to suggest other political imaginaries? Within a violent archive, can we find ghostly figures of the living dead - those who are abandoned to decay, neglect, and death - and use the rhetorical moments in which they briefly appear to conjure futures not yet imagined?